Father Tommy Conway was born in Galway, Ireland. He came to Hattiesburg in 1986 and the following year, Darian Pierce became aware of the jovial transplant residing in the Magnolia state. Darian and Father Tommy finally formally met at a friend’s house in 1999. Darian and several others shared a trip to Ireland with Father Tommy. The group enjoyed a country of high spirited, happy and family-oriented people. People who were a lot like Father Tommy. Throughout their visit, the Pierces observed over and again the ambiance of quiet family joy. That quiet family atmosphere is lacking in the American version of the Irish pub today. A true Irish pub is not a noisy calamity. It is a joyful family environment where conversation, laughter and real human conversation and friendship is fostered. 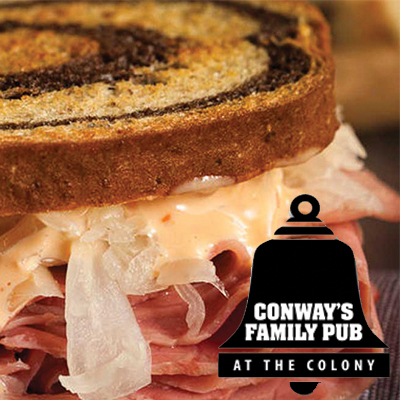 Bringing back that sense of warm, family environment is the goal of Conway’s Pub. The commitment is to an atmosphere of not just employees and customers but of family, where bread is broken and there are no strangers. A place to meet friends you haven’t met, and family you didn’t know until a visit to this authentic Irish Pub.